It seems like 3D is everywhere. Movies, living rooms. Even real life is 3D! But how does it all work? Most 3D operates on a single basic principle—tricking our dumb, binocular brain into interpreting a 2D image into one with depth. The most basic way to do this is stereoscopy, which is essentially showing a slightly different image to each eye, which the brain mashes together into a 3D image. It's easiest to do stereoscopic images with glasses or other dorky eyewear to change how you see stuff—hence there are a lot of variations in 3D glasses tech. An anaglyph image is the old-school, cheap 3D we all know and have mild nostalgic attachments to: An image has two different color layers, one for each eye, with slightly different perspectives. When we look at them through those awesome plastic glasses (usually with red and blue lenses) that block one layer in each eye, our easily tricked brain takes the resulting separate image from each eye and mashes them together to make a 3D scene in our head. Polarized 3D glasses are the more modern choice for 3D for the masses—you've worn them if you've caught Avatar or Tron: Legacy or any other big-budget movie in 3D, since the big advantage they offer over anaglyph 3D is full-on color. They work kind of the same way as the red/blue glasses—two synced projectors throw images with slightly different perspectives up simultaneously, but at different polarizations. The polarized glasses only allow a single corresponding polarized image into each eye, and the brain does the hard work again, combining two separate images into a single 3D one. While it's mostly used in theaters now, it could be coming to living rooms in the next couple of years. If you buy a 3DTV from any of the majors—Sony, Panasonic, Samsung, etc.—or have played a PC game in 3D with Nvidia's 3D Vision tech—you're using active shutter glasses. They actually block vision alternately in each eye, synced with the refresh rate on the display. The glasses rapidly darken each lens while the display alternately shows images with a slightly different perspective (this is called alternate frame sequencing). It's essentially the "show different stuff to each eye" principle taken to its logically absurd conclusion—literally blocking the sight of the unwanted eye. Yes, these complicated goggles usually run over $100 and are heavier than the dorkiest dorky dork glasses, but they're the best 3D technology at home for the moment, and will be for at least the next couple of years. The Pulfrich effect is a brain bug where side-to-side motion is interpreted to have some depth when there's a slight sync lag between your eyes. A set of glasses with a dark lens over one eye will make this happen, so when something moves from left to right, it'll look like it's moving back or forward—you know, in 3D. It's been used for the Super Bowl and Married with Children, since the glasses are so cheap. A parallax barrier is one of the more popular ways for swinging 3D without glasses. It's what's behind the Nintendo 3DS's 3D magic, along with old school Sharp 3DTVs (Sharp's making the 3DS's screens), and the back of Fuji's 3D camera. 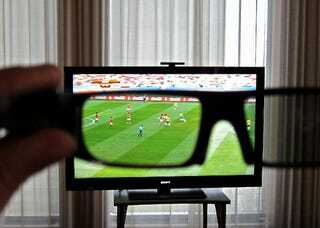 It actually works a lot like polarized glasses, it just moves where the obstruction magic happens to the front of the TV. Instead of having glasses filter the image for each eye, the screen's parallax barrier—think of it is a very finely grated fence with precisely angled holes—directs different light into each eye, and your brain turns the mixed signals into a 3D image. The bad part? With a normal parallax barrier, the screen is permanently in 3D mode and you don't have exactly have a wide viewing angle. Sharp's trick for 3D in its LCD displays is fancier—there's a second LCD that creates the parallax barrier with a polarized grid of lines, which is nice because you can turn it off and go back to regular 3D viewing. Integral Imaging is a form of parallax actually. You've got a bunch of supertiny micro-images that you actually peep through an array of spherical convex lenses, one per micro-image. All these micro-images come together when you look at them to form a 3D image. Another form of parallax is continuous-motion parallax. Here, HoloVizio's system dumps pixels in favor of voxels, which can project multiple light beams in multiple directions simultaneously. Something you still wanna know? Send any questions about 3D, double Ds or croissan'wiches to tips@gizmodo.com, with "Giz Explains" in the subject line.